As DragonBall Z starts, we're introduced to the race of super-humans known as the Sayajin who are, in a sence, planet brokers. They send their fighters to planets across the galaxy to exterminate the populous so that they can exploit the planet's natural resources. And that's where our hero Goku comes in. Being a Sayajin himself, he was originally sent to Earth to do just that... but in an accident when he was a child, he bumped himself on the head and forgot his mission. Instead of growing up heartless and cruel like all Saiyajin's, Goku grew up kind an gentle. And meanwhile, halfway across the galaxy, the rest of the Sayajin's left alive don't know what the heck's going on with Earth, so they send another Sayajin after Goku to see just what the heck went wrong. And so... the DragonBall Z story line begins. 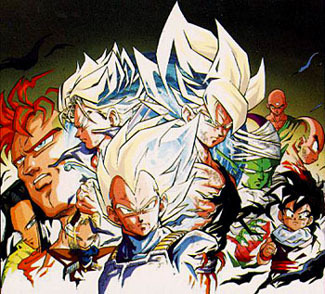 Dragon Ball starts off with the Saiyajin Saga. This saga is used to first introduce us to the main characters of DragonBall Z, and to begin to explain a bit about Goku's past and catch up on what happened between the original series (Dragon Ball) and this series. The series starts off with a mysterious alien visitor claiming to be Goku's older brother. He's of the same race of planet broakers as Goku is, the Saiyajins. When Goku refuses to join his brother in destroying Earth, a battle ensues that ultimately causes the death of Goku. But the story doesn't end here. There are two more Saiyans coming to Earth to finish the job Goku was SUPPOSED to start. 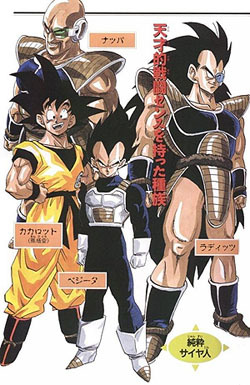 The two Saiyans, Vegita and Nappa will arrive on earth in one years time from Goku's death. During this year, Goku struggles in heaven to train to become stronger to beat the new Saiyan threat and manages to be resurected just in the nick of time. The battle of the Saiyan's begins and tests Goku's new powers. Who's to be victorious?. The Saiyajin threat has left Earth, left a nice handful of the main characters dead, and left Goku quite injured. But during Goku's battle with Vegita, he learns from the Saiyan Prince that there is another set of Dragon Balls on the planet Namek that are more powerful than the Dragon Balls found on Earth. So now, the Z team needs to get to Namek to use their Dragon Balls to resurect their fallen friends. But how? Mr. Popo and Kami-sama have a ship that the crew uses to blast off into space, leaving Goku to recover and follow at a later date. But when Bulma, Krilin and Gohan reach Namek, they find it invaded by the evil henchman Freeza and his goons. And to make matters worse, Vegita's found the planet, and is after the Namekian Dragon Balls as well! But wait! Vegita, who once worked for Freeza, has switched over to the Z fighters side in order to beat Freeza down from his throne. Through battles with Freeza's henchmen, the Ginyu Force and finally Freeza himself, Goku unlocks a hidden power that transforms him into the legendary Super Saiyajin. During the conflict, our turncoat hero, Vegita, is killed shortly after the Great Dragon is called, leaving Goku to fight Freeza alone. Can he do it? 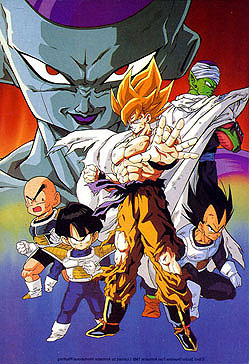 The next threat to earth comes from Garlic Jr., the same Garlic that Gohan trapped in the Dead Zone back in Movie One. But that's nothing compared to what's next. Another ship lands on earth. It's Freeza and his father King Cold! They're back to destroy the earth but are cut short when a mysterious young man from the future steps in to stop them. And where's Goku? He's two hours away from saving Earth? Can he make it in time? With Frieza out of the picture, the mysterious visitor from the future, Trunks, warns the Z team that they will all die at the hands of the Artificial Humans that will arrive on earth in 3 years... a band of Dr. Gero's Red Ribbon Army that destroys everyone in the youth's future. But when the androids DO arrive, something goes horribly wrong. They're fighting the WRONG androids! Somehow history was changed drastically and Dr. Gero creates more androids than he's supposed to. 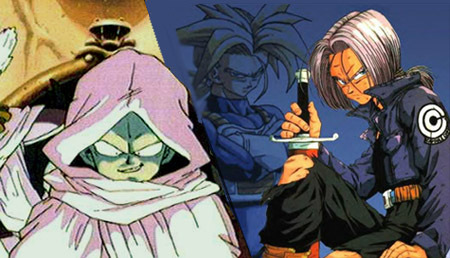 Trunks has to travel back in time again to help them.